Background: Purinergic signaling accounts for a complex network of receptors and extracellular enzymes responsible for the generation, recognition and degradation of extracellular ATP and adenosine. The main components of this system include P2X, P2Y and Adenosine Receptors, ectonucleotidases CD39 and CD73 and Adenosine Deaminase. 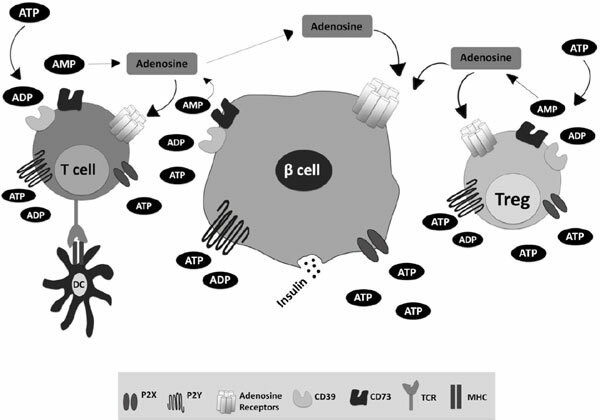 The purinergic network recently emerged as a central player in several physiopathological conditions particularly those linked to immune system regulation including type 1 and type 2 diabetes. Methods: Here, we give an overview of recent findings linking purinergic signaling with diabetes pathogenesis, including purines roles in altered glucose homeostasis, impaired metabolic control, and immune system-mediated pancreatic β cells destruction. We particularly focused our attention on established preclinical experimental models of diabetes development and therapy including NOD mice, streptozotocin-induced β islets degeneration, and islet transplantation. Results: The summarized studies delineate a central role of purines, their receptors and degrading enzymes in diabetes by demonstrating that manipulation of the purinergic axis at different levels can prevent or exacerbate the insurgency and evolution of both type 1 and type 2 diabetes. Conclusion: The reported preclinical data and the availability of several effective compounds targeting the different steps of the purinergic response strongly suggest that P2 and Adenosine Receptors or ecto-nucleotidases will be feasible therapeutic targets for the treatment of diabetes. Diabetes, purinergic signaling, P2X, P2Y, adenosine, adenosine receptors, adenosine deaminase, beta cells, islets, metabolic syndrome, extracellular ATP, type 1 diabetes, type 2 diabetes, inflammation.